I was never much of a reader, I then went on to read a book a month for 18 months and now regularly enjoy reading and taking what I call "golden nuggets" away and implement them in to my business and coaching. Captain David Marquet was used to giving orders. In the high-stress environment of the USS Santa Fe, a nuclear-powered submarine, it was crucial his men did their job well. This is the original Make a Difference that started the EAGLE Leadership Series and has led to the expansion of Dr. Little's executive coaching work spreading to a national and an international audience. Throughout the story, Lencioni reveals the five dysfunctions which go to the very heart of why teams even the best ones–often struggle. He outlines a powerful model and actionable steps that can be used to overcome these common hurdles and build a cohesive, effective team. Mark Sanborn met his postman, Fred, just after he moved to Denver. Fred knocked on his door, introduced himself and welcomed him to the neighbourhood. Traction: Get a Grip on Your Business : Inside Traction, you’ll learn the secrets of strengthening the Six Key Components™ of your business. You’ll discover simple yet powerful ways to run your company that will give you and your leadership team more focus, more growth, and more enjoyment. Based on years of real-world implementation in thousands of companies, the Entrepreneurial Operating System is a practical method for achieving the business success you have always envisioned. 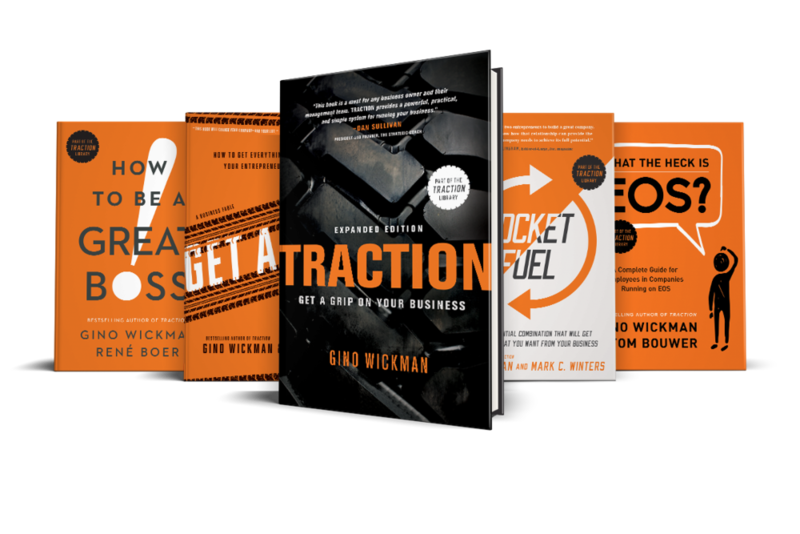 Rocket Fuel: The One Essential Combination : Rocket Fuel details the integral roles of the Visionary and Integrator and explains how an effective relationship between the two can thrive. You’ll also get advice to help Visionary-minded and Integrator-minded individuals find one another. When these two people come together to share their natural talents and innate skill sets, they have the power to reach new heights for virtually any company or organization. Get a Grip: An Entrepreneurial Fable : Filled with familiar situations, real-world characters and detailed, fully-applied tools, Get A Grip vividly illustrates the right way to implement EOS® in an enjoyable fable format, making it easy for you to translate this story into results for your own business. How to be a Great Boss : Studies have repeatedly shown that the majority of employees are disengaged at work—but it doesn’t have to be this way. Often, the difference between a group of indifferent employees and a fully engaged team comes down to one simple thing—a great boss. How to Be a Great Boss presents a straightforward, practical approach to help bosses at all levels of an organization get the most from their people. What the Heck is EOS? : Designed to engage employees in the EOS process and tools, What the Heck is EOS? uses simple, straightforward language and provides questions about each tool that managers and employees can use in creating more ownership and buy-in at the staff level. After reading this book, employees will not only have a better understanding of EOS, but they will be more engaged, taking an active role in helping achieve your company’s vision.